Understanding our client's business strategy means their property strategy is properly designed and implemented. We ensure the role of property is fully represented at board level. At Edward Preece & Co our aim is always the same, whether you have a single office employing five people or a multi-site business employing 5,000 – to enable all businesses to benefit from our corporate property advice, based on over 20 years of experience. We have worked with a wide range of businesses and this experience gives us a perspective of property not available within most companies. As commercial property advisors we will develop a strategy that is tailored to each client. We understand that every strategy needs to be adaptable to changing business objectives and market trends – strategies are never set in stone! One of the underlying aims of every property strategy is to support business growth through developing and improving property assets. Whether you are reviewing and revising your ongoing property strategy or undergoing a full corporate restructure, we will ensure that your property portfolio matches the needs of the business and is being used to its full potential. 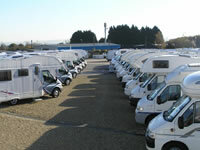 In 2008 Brownhills Motorhomes Ltd, the largest motorhome retailer in the UK, went through a process of corporate restructuring and Edward Preece & Co worked closely with the Directors to ensure that their property portfolio matches the needs of the business going forward. We were also appointed to secure new sites in the SW, SE and NE of England. Having developed a close relationship with the senior management of Brownhills Motorhomes and a good understanding of the business during the acquisitions, we were then appointed to manage and take full responsibility for their properties across the UK. As part of our portfolio management role we worked with architects, engineers and quantity surveyors to secure planning for a new 60,000 sq ft showroom facility in the North West of England and we are currently carrying out a similar exercise for one of their other sites.